You have to hand it to Funko. They know their memes. The figure above is officially called “Wounded Dr. Ian Malcolm,” but you barely notice his injury thanks to the super-distracting…eyes. (You thought we’d say chest. That too.) In all the years that Hasbro made Jurassic Park toys, they never gave us bare-chested Jeff Goldblum, and that might have been a worse idea in the history of bad ideas than taking dinosaurs off the island. But when Funko announced a Jurassic Park line, well we should have guessed that ooh, ahh…that’s how it starts. But then there’s running! And screaming! And cartoon Wayne Knight with a face full of poisonous dinosaur barf! Nedry and Dilophosaurus are Entertainment Earth exclusives, while the gold will be on the bloom at Target. There is, as yet, no armless Samuel L. Jackson, but the way the line is going so far, he seems like a prime target for the next exclusive. Well, him or Mr. DNA. Or a “Sam Neill menacing small child” two-pack. You can get “normal” versions of all the primary (male) characters as well–where’s our Laura Dern, dagnabbit? But the real fun of any Jurassic Park line is, of course, the dinosaurs, who look about as sinister as Funko ever gets. 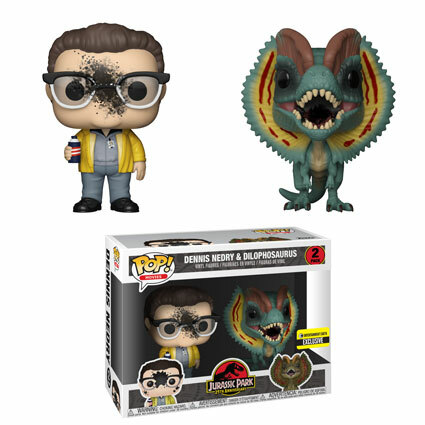 In addition to the exclusives, there will be a rare chase figure: the dilophosaurus in non-attack mode. Combined with attack mode and the two pack, the spitter is the star of the line, if ubiquity is akin to star power. Check out the rest in our mini-gallery below. Then leave a comment telling us which meme-worthy variant Funko ought to bring to life next!